A DIFFERENT SPORTS CAR FOR EVERY DAY OF THE YEAR! Sports cars make up one of the most beloved automotive genres for the majority of car fans – in fact, you’ve probably heard that “Getting there is half the fun” and “It’s the journey not the destination” well, whoever coined those phrases was probably driving a Ferrari or a Porsche! 365 Sports Cars You Must Drive provides fun facts and overviews on the greatest, oddest, most beautiful, and most ill considered sports cars of all time. Every sports car you’ve ever dreamed of driving - and a few that never occurred to you – is presented in this entertaining volume making this the perfect read for all automotive enthusiasts. 365 Sports Cars You Must Drive includes hyper-performing German supercars to classic British roadsters, including icons like Ferrari, Lamborghini, Porsche, and Corvette to everyman sportsters from Triumph, MG, Sunbeam and Miata to oddballs like Crosley, Sabra, and DB. 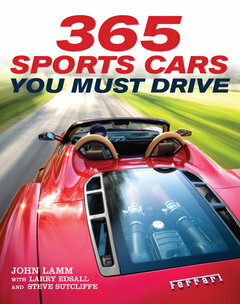 Sports cars inspire passion and strong opinions as few other vehicles on the road could and authors John Lamm, Larry Edsall and Steve Sutcliffe put you in the driver’s seat of 365 unique sports cars, each with a road to travel and a story to tell. How many have you driven……..dreamed about……….or even shuddered at the thought of? 365 Sports Cars You Must Drive is available to order in the UK from Amazon.co.uk or Grantham Book Services on 01476 541080 - Published by Motorbooks in Paperback ISBN: 9780-7603-4045-5. Larry Edsall was snatched away from a career as a daily newspaper sports editor to become motorsports editor at AutoWeek magazine. Before long, he was its automotive industry news and motorsports editor, and for most of his 12 years he served as the magazine’s managing editor. Edsall left Detroit for Phoenix in 1999 to help modernize one automotive website then launched another, www.iZoom.com. He is a freelance contributor to several automotive and lifestyle publications. Award-winning writer and video presenter Steve Sutcliffe has been working in automotive journalism for more than 20 years, and is the editor-at-large for Autocar magazine, the UK's oldest, most-respected, and biggest-selling weekly automotive publication. His work has appeared in numerous newspapers and periodicals, including the Guardian, Sunday Times, Stuff, Motorsport, and Classic and Sports Car. A race driver of some repute, he competed in the British Touring Car Championship for Lexus in 2001, and in the TVR Tuscan Challenge from 1998–2000, and has driven many of the cars profiled in 365 Sports Cars You Must Drive. He lives in Hove, East Sussex, UK.